A stamp on the loom states that it was designed and made by the W.P.A. Craft Shop Oshkosh, Wisconsin, It was purchased in North Carolina for $10. We added some rubber bands and the loom was ready for warp. Jim made the five shuttles from assorted hardwoods. Jim is retired from the Air Force and suggested that Elizabeth thread up an Air Force Tartan (the pattern shown on the loom). The pattern requires black, red, white, light blue and dark blue. 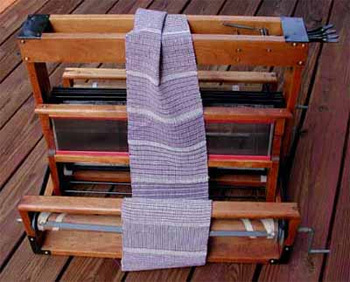 Elizabeth wove this color-and-weave sampler on this 20-inch four-harness Structo loom. We did not have the full compliment of spools, so Jim manufactured a wooden warp beam. Someday we hope to find a stash of these elusive warp spools and set the loom up as it was designed to operate. (Update: A huge Thank You to Mary in Maine. She had the required number of spools for the loom.) The finish was badly damaged when we got the loom, so we decided to completely refurbish the loom. The wood appears to be cherry. The newly painted metal parts and new brass screws make it our most attractive loom. Elizabeth warped this little loom for Jim to weave a table runner using green, gold, and cream. The harness are raised and lowered by rocking the pin on the roller top forward and backward. The shuttle bobbins are still attached to this work in progress. 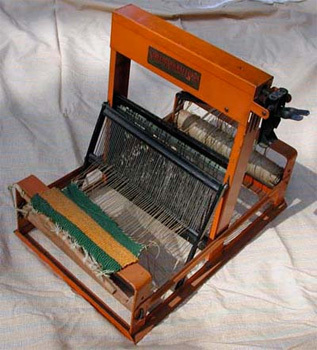 While there are no markings on the loom, it is probably a Peacock 12-inch loom made by The Handcrafters, Waupun, Wisconsin. We don't have a manual for the loom, but if one has ever warped a loom, there are no surprises with this model. Looms like this would be perfect for schools or for anyone else who wants to learn the basics of weaving. 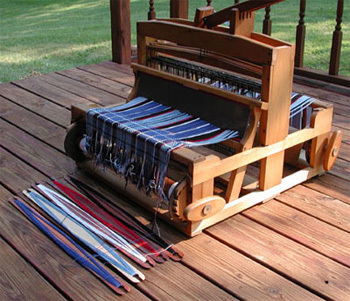 This loom was found at the Genesee Country Village Antique Show in New York 2006. We liked the color coordinated weaving that someone had started. 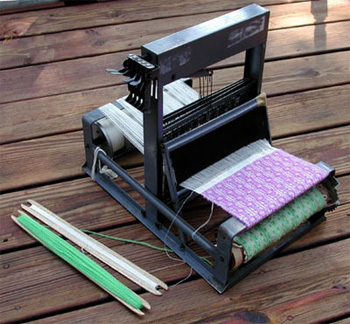 This nice little 4-harness loom is great for weaving samplers. At one time, warp could be purchased pre-wound on metal, or later, plastic spools. We used some empty spools from our 20" loom and wound them ourselves. The overshot patterns are from "The Complete Book of Bertha Hayes Patterns." 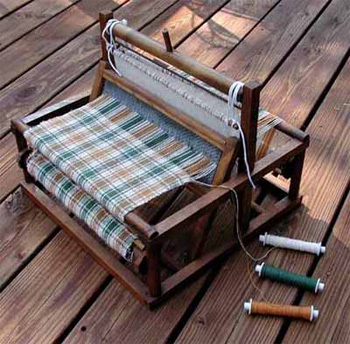 Her mother, Eileen, gave this unusual loom to Elizabeth for her birthday. (Thanks, Mom!) While most looms require the weaver to operate foot treadles or hand levers, this loom requires only the advancement of a hand-wheel. To program the loom, there are a series of pins that are inserted into the cylinder. When the hand-wheel is rotated, each pin raises the appropriate harness(s) similar to operating one or more foot treadles. The concept is quite good and the weaver should be able to walk away for a while, return, and easily resume without figuring where they left off in the pattern. We have managed to find all three variations of this loom. 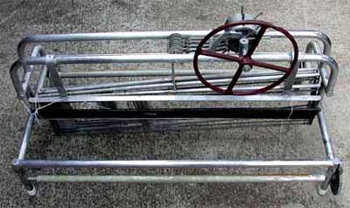 Pictured is the four harness model. The eight harness loom looks very similar with two of the pin cylinders and four more harness. 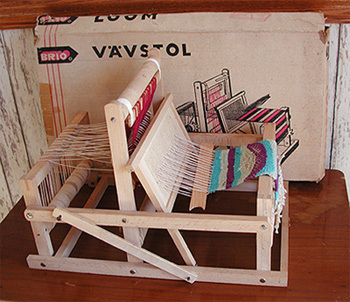 The third model was designed for school weaving programs. We have not had the opportunity to make the loom operational, but don't anticipate any major problems. We are now on the search for the wrench used to advance the beam and the shuttles that were designed for the loom. This little loom was purchased just up the road from The Brown House near Ripley, West Virginia. The best feature of the Brio is that it folds up very compact to about only 2 inches high. The weaving seen on it was there when we purchased it during November 2006 and we see no reason to improve on that. It has two harnesses.